Chef Delio Susi’s second restaurant, Sulmona, takes its name and its culinary inspiration from the town in Northern Italy where his mother grew up. 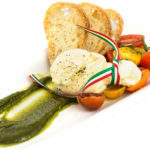 Located just a few blocks from its sister restaurant, Amelia’s Trattoria, Sulmona serves a menu of antipasti, street food, pasta, pizza, salumi and secondi. Diners will find dishes like lamb skewers, fried artichokes, and a vegetarian version of arancini. The pizzas, along with other dishes like braised wild boar, are cooked in a high-powered oven, and there’s plenty of porchetta available in panini, on pizza, and as the star of the plate. The decor also channels all things Italian. Design elements behind the bar evoke the aqueducts of Sulmona and a bright red old-school Vespa suspended from the ceiling. The spacious room features a lengthy bar, as well high tops, cozy banquettes, a communal table and a ten-seat chef’s table for diners who want to take in all the culinary action. Chef-owner Delio Susi, Jr. may have the training of an engineer and mind of an architect (and the degree to go with it) be he’s got the heart of an Italian chef. His appetite, skill, and love of good food have made Amelia’s Trattoria one of Cambridge’s hidden gems. Susi’s culinary career began as soon as he graduated from school in 1997. Though his diploma said Architecture and Construction Management, Susi, without hesitation, headed to the kitchen instead of the construction site. Working alongside his parents (but never in their shadow) Susi put his well-honed cooking skills to good use – he’d been making homemade sausages since he was thirteen and knew fresh pasta as well as he knew blueprints, so it was hardly a stretch or a surprise. Indeed, the Susis have been a venerable food family on the local landscape for years. Amelia’s Trattoria, which Susi opened in December 1999, is an homage to his mother Amelia – who taught him from the heart and from the start. The restaurant, tucked just off the beaten path near Kendall Square, is known for its excellent, hand-crafted Italian food. Susi has earned a loyal following with his handmade pasta (especially his gnocchi – meltingly lush little pillows) and his skill with meat (especially braised short ribs). Susi opened his second restaurant, Sulmona, just outside Kendall Square in Cambridge. Just a couple blocks away from its sister restaurant, Sulmona showcases a mix of antipasti, street food, pasta, pizza, salumi and secondi. Susi works with his wife Rebecca, who is the backbone of the business. When they’re not busy running the restaurant they spend as much time as possible with their daughter Amelia. Susi loves drumming, jazz and funk music but nothing (besides being a father) can compete with his true love of cooking and eating great food.